Tales From a Kumaoni Village. Loud Hindi music blares through the silence of the valley, carrying the wind with it. Women dressed in their most pink and jazzy attires walk down the path to a village hut below, big smiles pasted on their faces, their eyes fixed on their toddlers who keep running faster than their fancy heels can take them. 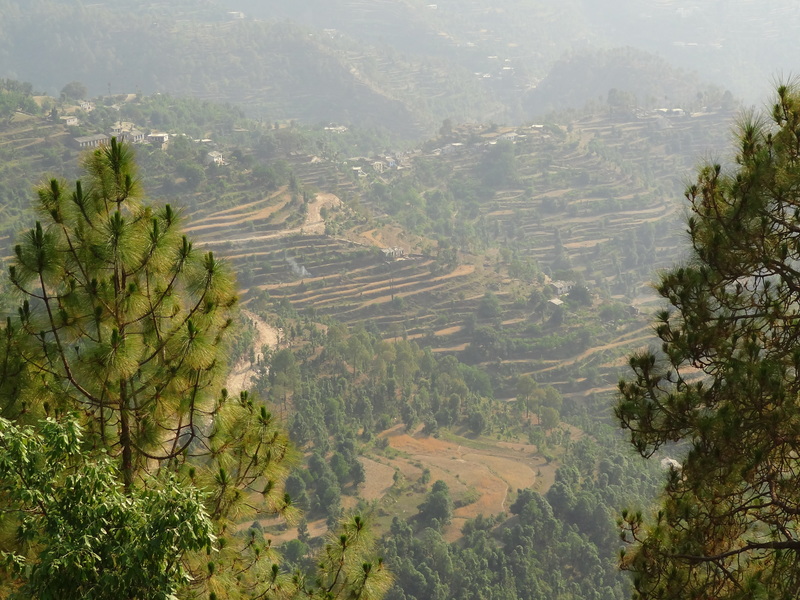 This is not your usual day in Peora, a small village quietly tucked away in the forests of Kumaon in Uttarakhand. It’s the day before a wedding, and the entire village seems to be rejoicing, dressing up, laughing, singing, dancing, feasting and celebrating. I arrived in Peora this morning, in an attempt to ‘disconnect’ from my online addictions, and as we drove from the Kathgodam train station past the lakes of Bhimtal, along slopes dotting with pretty green pine trees, through python-like winding roads, and amid dense coniferous forests, I knew I was going to the right place. As we went higher, the air felt cooler, and the effects of spring brighter. I walk up the hill road, weakly smiling at passersby, famished for lunch that no small dhaba seems to be offering today in lieu of the brewing wedding feast. A little shop finally seems open, with a few men playing carom inside, and a small stove burning on the side. I ask if I can get lunch, and seeing the reluctance of the owner, who is perhaps the only man in the village not all decked up & heading towards the wedding house, ask if I can get anything at all to eat. I heartily agree to the soupy maggi he has been whipping up for his buddies, and take my bowl to the balcony outside that overlooks the dense slopes, the valley below, and a faint outline of the Nanda Devi peak beyond. On the way back to my abode in the village, I meet a young woman dressed in pink, returning from paying her homage at the pre-wedding celebrations. We smile, and quickly fall in step with each other. She curiously asks about my family, and I about her and the village. Shyly revealing that Peora has been her home only after marriage, she goes on to tell me that she was married at 15, before which she never even saw her husband, and that she has six children. When she mentions that the first four are daughters, I immediately understand why the number went that high, and my new friend confirms my hunch by explaining how her husband thinks it’s pointless to spend money educating daughters because “they will marry and leave the house anyway”. She confesses that for that reason, her first daughter never went to school. As I contemplate what to say, she breaks into a proud smile; she has been investing all her earnings since she started working, in the education of the rest of the girls, who have promised to look after her when she grows old. I marvel at the fifteen-year-old who must’ve come to live with her new family without ever meeting them before, and borne kids as early as seventeen, when I was just finishing school. I’m not unaware that such is life in far flung parts of India, but to stare into its dark innocent eyes always sets you aback. We graduate to broader topics, and she tells me about the fruit culture of the village. Everything from apples to pomegranates to plums, aroos, and chestnut grows here, and forms the primary source of income for the village folk. We talk about the on-going wedding celebrations, and she lets me in on some village gossip. As word has gotten around, the boy and girl in this love marriage are related to each other as extended family, something that the families and the community initially took major offense against, but later conceded. The women who protested the most, she gleefully observes, were the ones dancing the most today. As I laugh and admit that there isn’t much one can do once a girl & boy have chosen each other, she assumes a serious air and condemns them, saying that it’s happened in the village before and it’s the worst way to shame your parents. She goes on to say that she told her daughters to elope rather than confess their love for a boy who could very well be their brother or uncle. I can tell there is no arguing here, so I take my leave and walk along. Sloped valley ideal for cultivation. By early evening, the sun is covered by grey clouds, which gradually give way to a hailstorm and some rain. To my roasted-in-Delhi self, this is an unexpected surprise and I thank the rain gods. As the clouds clear away and the outline of the Nanda Devi & Trishul peaks becomes more prominent, I decide to take a walk through the forest to the valley below. Through narrow clearings, I walk along green and dried orange pine trees glistening in the pre-sunset light, past vast clear patches of picnic spots, and over large barks of fallen trees, to arrive at village huts with tiled roofs, overlooking a sloped valley further below and panoramic Himalayan views ahead. The smell of wet earth in the forest air is divine, and abundance of pure oxygen makes me feel high. 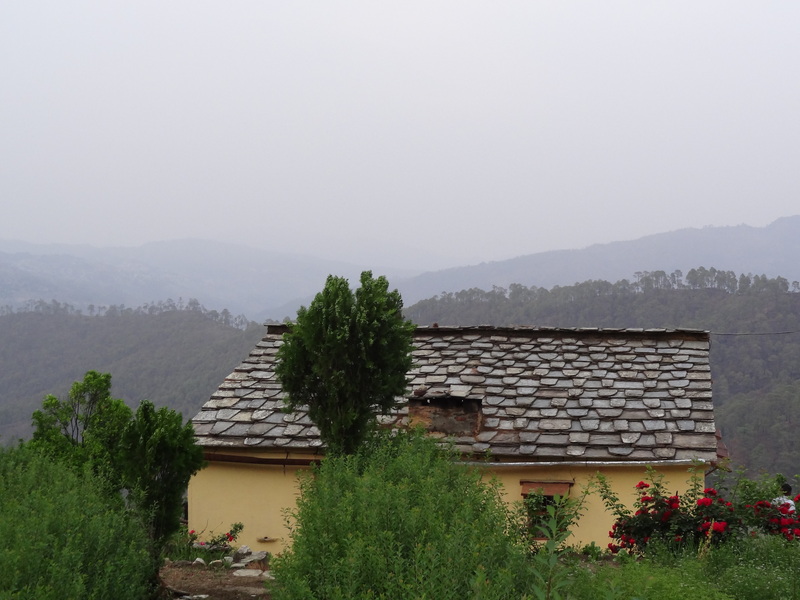 Traditionally charming Kumaoni huts with tiled roofs. I sit awhile, hearing the wind rumble through the forest to find me, watching glimpses of the mountain sunset through the cloud cover, and wondering what it would be like to spend your whole life in this charming little village. 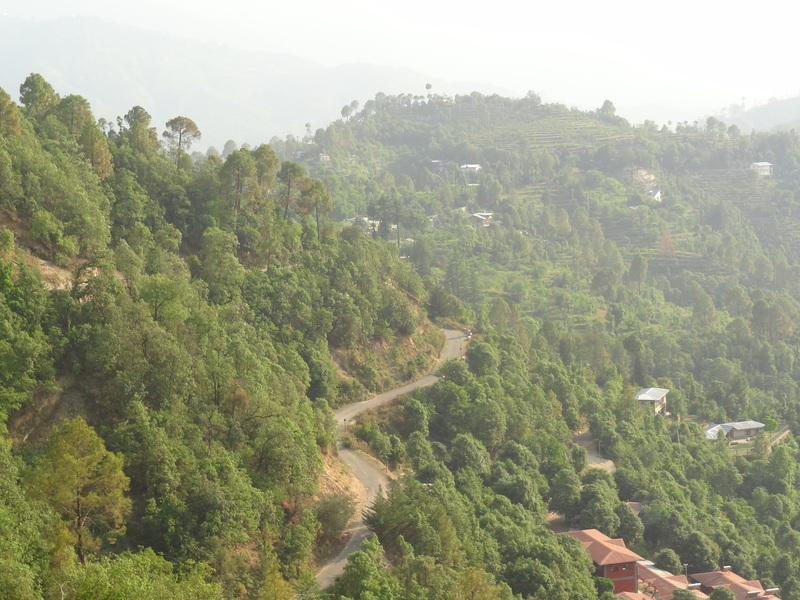 How to get to Peora: Almora is the closest big town, 28 km away. The nearest railway station is at Kathgodam and the nearest bus stop is at Haldwani. From both places, Peora is about a 3-hour (80 km) drive by car. Taxis are readily available and charge about INR 1100 for the ride.The nearest domestic airport is at Dehradun (approx. 290 km) and international airport at Delhi (approx. 350 km). Where to Stay at Peora: The Dak Bungalow at Peora. What to do in Peora: Soak in views of the Nanda Devi & Trishul peaks on clear days. Have maggi in the balcony of Mama’s shop. 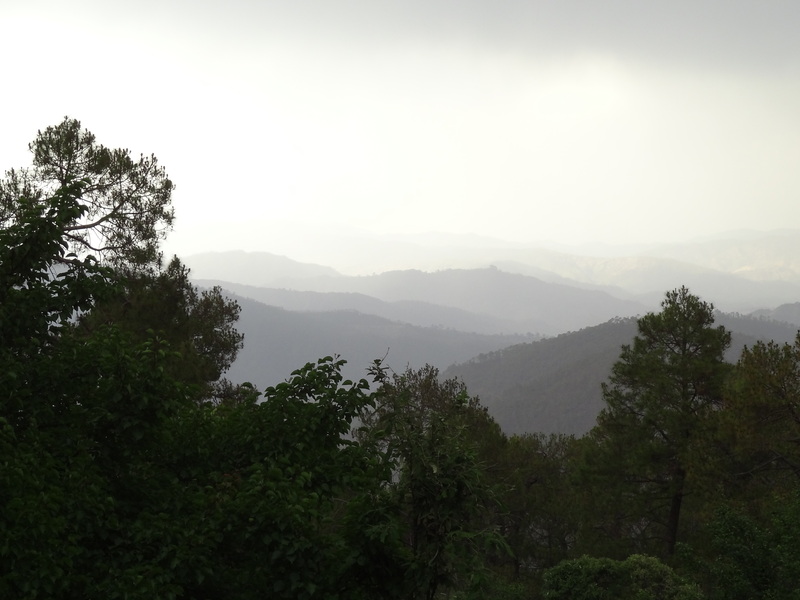 Do a day trip to Mukteshwar. Volunteer with Aarohi. Forest & village walks. Getting a chance to read your wonderful posting after many months! I will miss again when I vanish into the wilderness of Sahara for few months again! Kumaon is in my blood ..have traveled through the wilderness. Your writing brings the other dimension of life in the hills which I missed earlier. I had attended one marriage in a village near Choukari . In fact whole tourist lodge employees were invited and we being the only guest in December , we were also invited as Barat as well as to the grand party in the evening ..Of course there was more drinks than food , ha ha! By the way where is this place? I will be making a short trip to Naukuchia tal to spend few days with our relatives who stay there. May be I will drive down to the village Peora ( if it is within 60 Km of Bhim tal.. else during my next trip in Dec.
Let me see what all posts I have missed here . Hello Ushnish, welcome back to your break from the Sahara! The marriage sounds like fun. Unfortunately I got there too late, or who knows 😉 This village is about 1.5 to 2 hours from Bhimtal, and is definitely worth a visit. I stayed at a lovely old bungalow homestay overlooking the Himalayas, and we’re partnering with it as part of India Untravelled. I’ll send you a link once the details are up on the website. forest to the valley below. makes me feel high.”amazing!what a poetic rendition of thoughts.you give wings and flights of imagination to your reader!! Thanks Chinmay, I try 🙂 To be honest, it was such a beautiful place that the words came themselves. I can’t imagine spending my whole life in a small village. It could have happened to me. I married in Italy in a small village outside Sorrento nearly 40 years ago. If I had stayed my life would have been very different. And how different is really hard to imagine, isn’t it? I was born & brought up in a small town myself, and I wonder how things would’ve been if I never got out. We’ll never find out! Nice post. For me, interacting with the local people is often the best part of a trip. Especially the folks in the hills/smaller places who seem to have an uncomplicated approach towards life. I agree, and the words sound familiar. The best part of spending your whole life in a little village is that you never know what you are missing out on. Must be a desirable state of satisfaction when it comes to itchy feet! Very nice article, and sad story. That landscape looks familiar, I traveled around quite a lot when I was in Uttarakhand’s Kumaoni region, very likely I went past Peora. Such a fascinating and mysterious corner of the Indian Himalayas, I wish I could go back soon. Felt nice to read your post. Reminded me of the time I’d spent in a small town called Haldwani near Kathgodam, 20 years back. Thanks! I’m glad, Sajay. Haldwani is considered one of the bigger, more popular towns now, but I can imagine it must’ve been a quaint, untouched town 20 years ago. Do you have any pictures from then? nice post shivya! the reason i like reading your travel stories is cause you almost always write about the people there too and not in an exotic, look at their headgear kind of way but as people with their own stories and lives! Most people don’t take out the time to consider that the beautiful holiday destinations are homes to people and their lives though exotic to us could be mundane, difficult and challenging and that the smile that they give us or the kindness they bestow is in spite of those challenges! And thus that much more precious and inspiring! I am a new follower of you,i happily admit. :)…U r truly a women of substance.I always wanted to be a traveler but what kept me away was the fear of travelling alone.I think its difficult for a girl to travel alone but you really inspire me.Can you please share a few details of your beginning towards travelling.Hope you understand my concerns. Thank you Subha, I’m glad to be of inspiration =) I just penned a post on the beginning of my travels – http://the-shooting-star.com/2012/06/14/how-i-quit-my-job-to-travel/ – Hope you enjoy reading it. Feel free to ask me any questions you have in the comments! 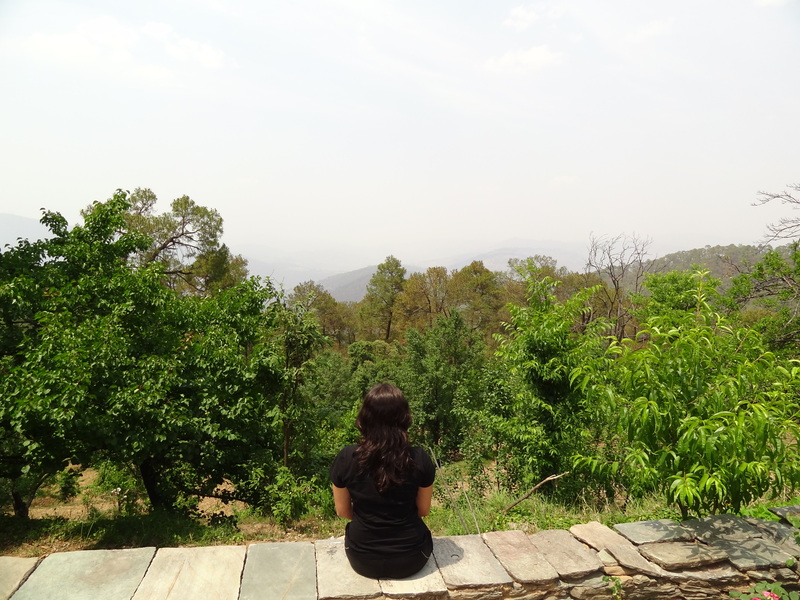 The hills of Kumaon have always been enchanting and luring, travelled in this land of hills almost like a religion – Kumaon always attracted me towards itself. 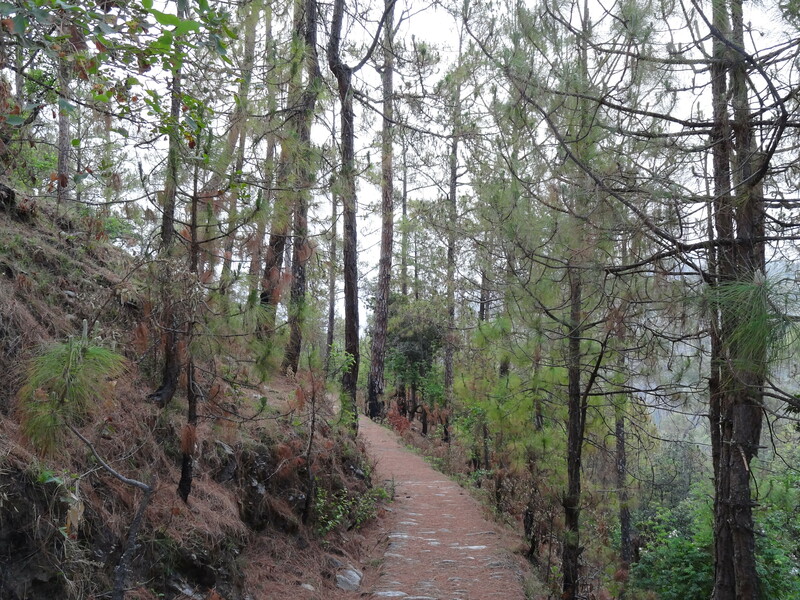 Kumaon is filled with wonders! I have been to many places with my family and loved every bit of it from the jungles to the scenic mountain views… The mountains have always beckoned my father and me! Its really good to read so much about India on your blog!!! Superb experience, it would have been… this article helped me in My Class IX OTBA material from CBSE for SST. I am so very excited reading your blog!!! You’ve had nice experience there with local people!! We have a friend who has left her job and is working with an NGO there! Super excited ! cant wait to encounter the same experience like you had! I am from Pithoragarh, Uttarakhand. I am grateful to you that you visualize me my little village. Now a days I am far away from my village. As you have described about Peora village, was seeming like I was also with you during the journey. Previous Post“Life on the Farm” at Prakriti Farms. Next PostFinding home in Vietnam.